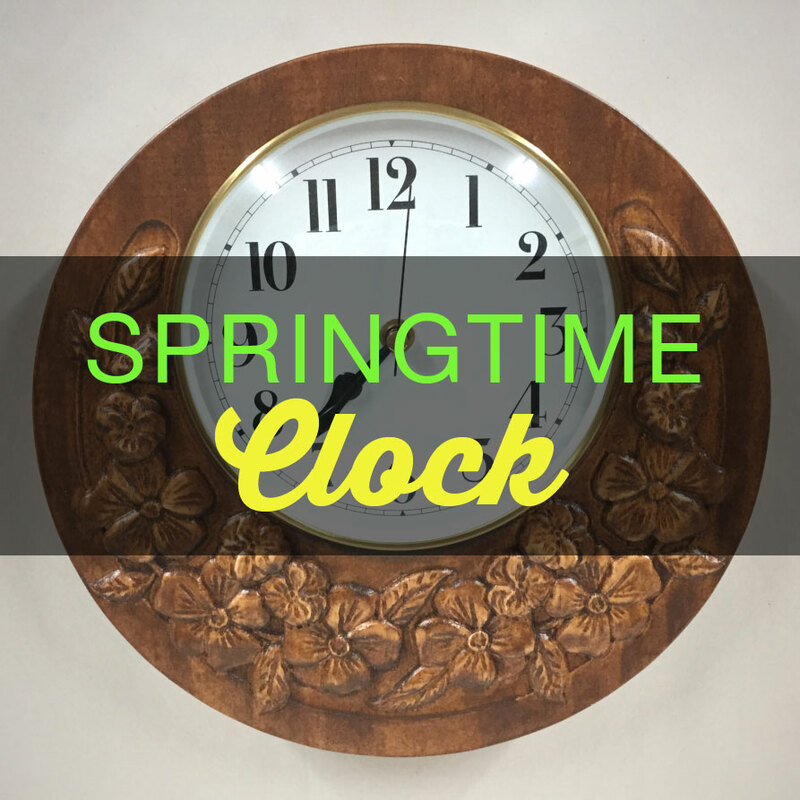 This Springtime Clock can be displayed year-round in virtually any decor setting! 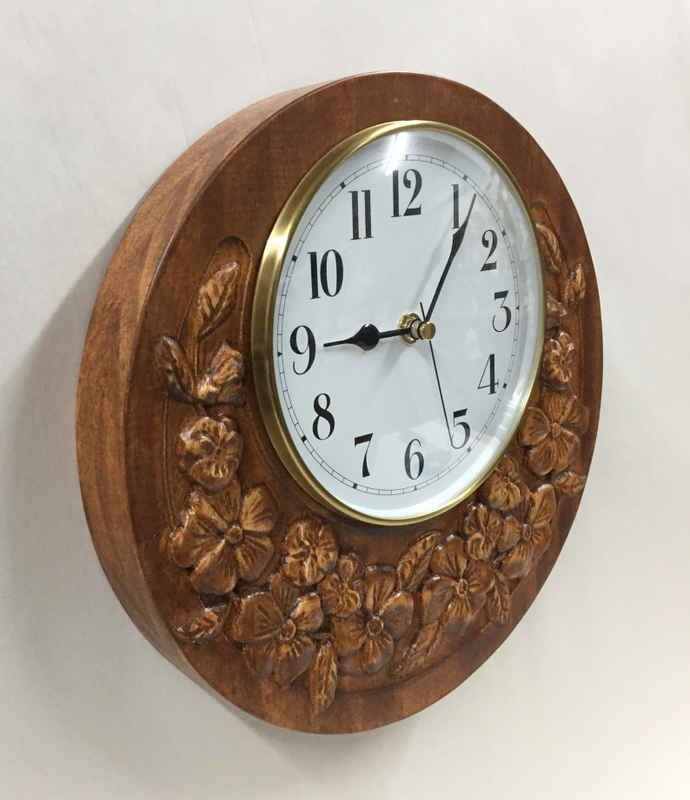 The nature-inspired design features carved flowers and leaves nestled inside a shallow, gently curved recessed area which highlights the unique offset clock mounting. 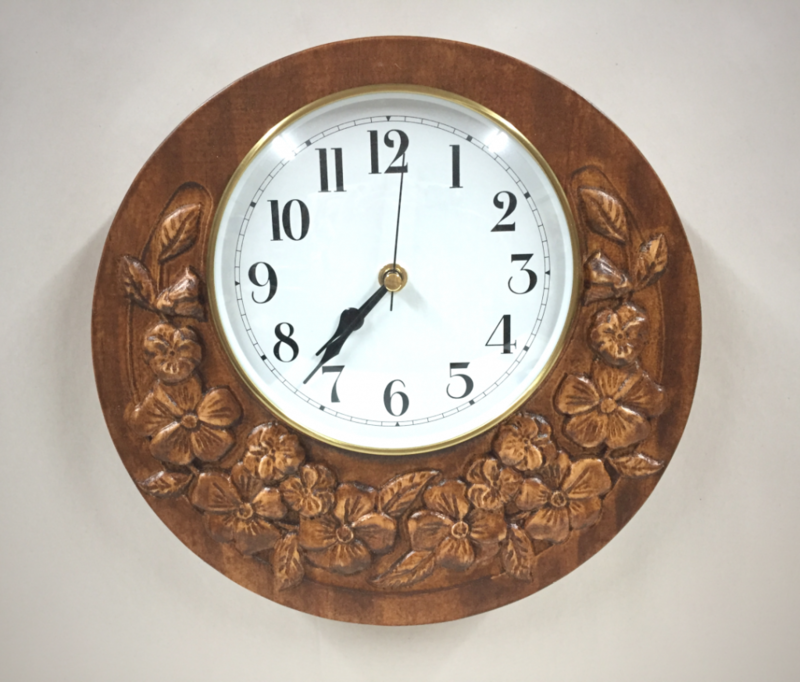 The Springtime Clock makes a very nice and functional wall accent for your home or office. It’s a wonderful gift item for all sorts of occasions, such as weddings, house warming, Mother’s Day and more! Get projects like this delivered to your inbox every month for only $10/month. 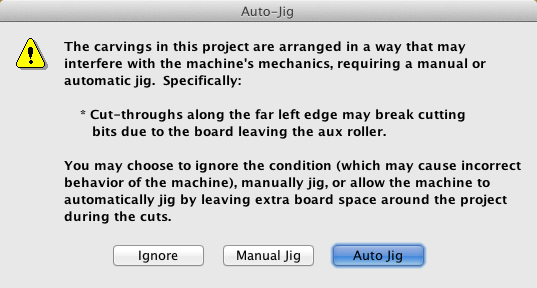 NOTE: Do not use boards that are smaller than specified above unless using an appropriate jig. 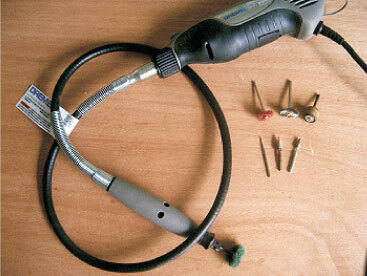 A Dremel-type rotary tool with assorted abrasive attachments to aid the sanding process. 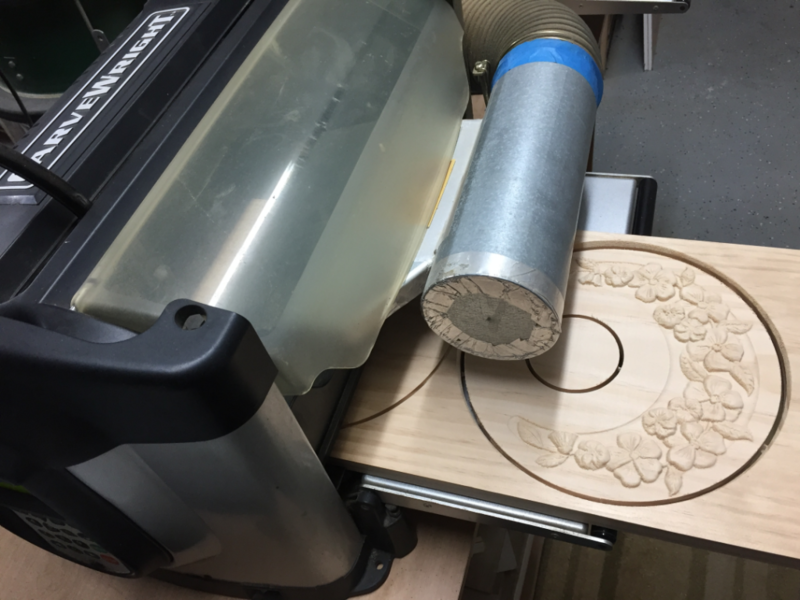 A spindle sander and small belt sander can help speed up sanding/surface prep. DO NOT RESIZE or SCALE the projects! If prompted, always keep the original size. No scaling! 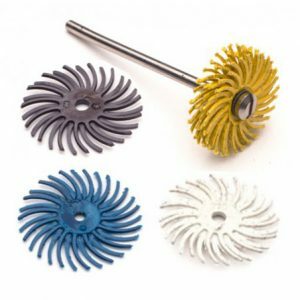 Select Cutting Bit: 1/8″ Cutting – Press ENTER. The machine will move the bit holder to the center. Select Carving Bit: 1/16″ Carving – Press ENTER. The machine will move the bit holder to the center. 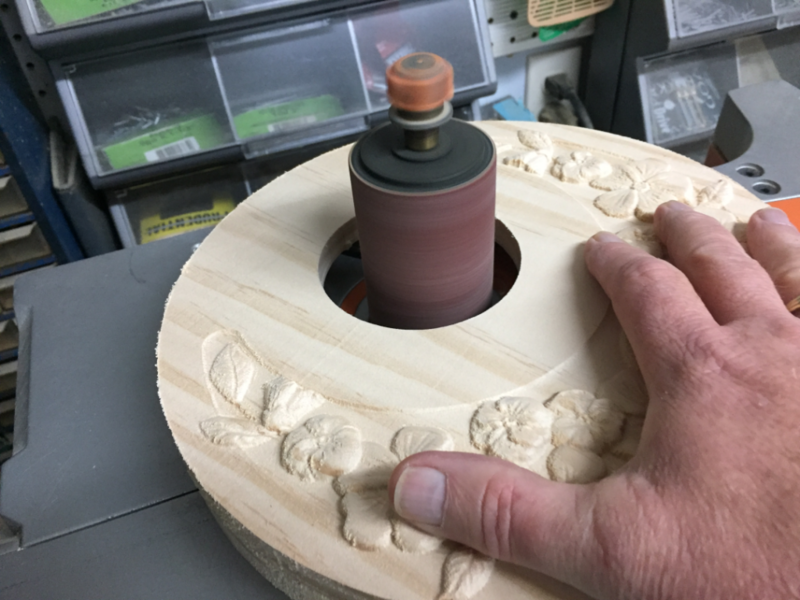 Load Bit: 1/16″ Carving – Remove the 1/8″ cutting bit, and insert your 1/16″ carving bit, then press the green ENTER button. 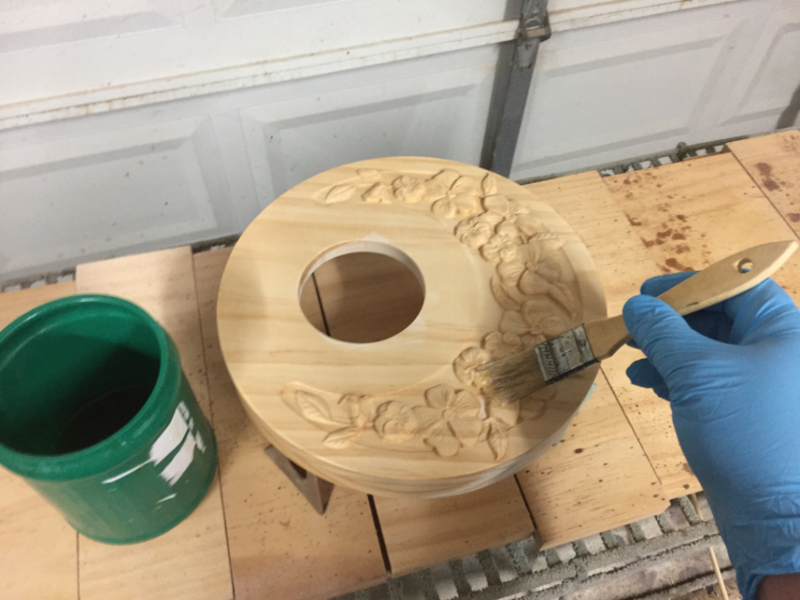 After homing and finding surface, the carving process is performed. 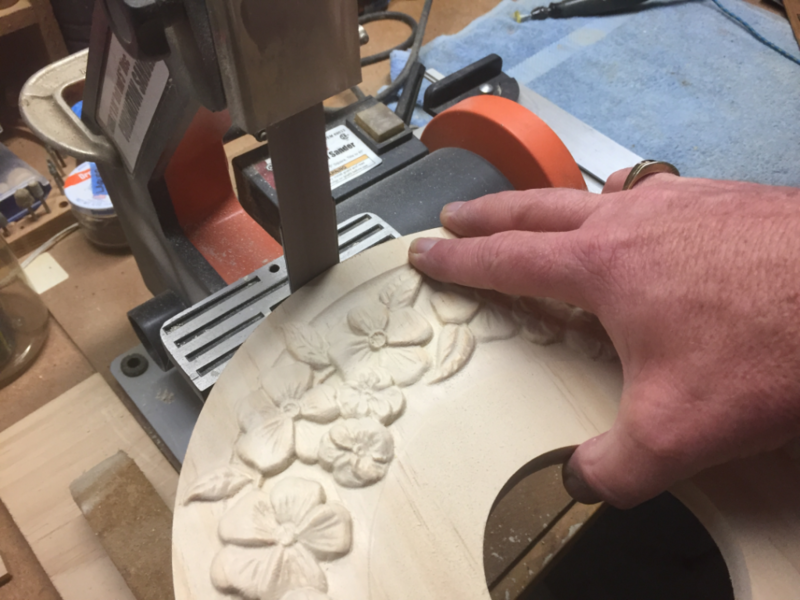 After it is done carving, you will be prompted to load your 1/8″ cutting bit. 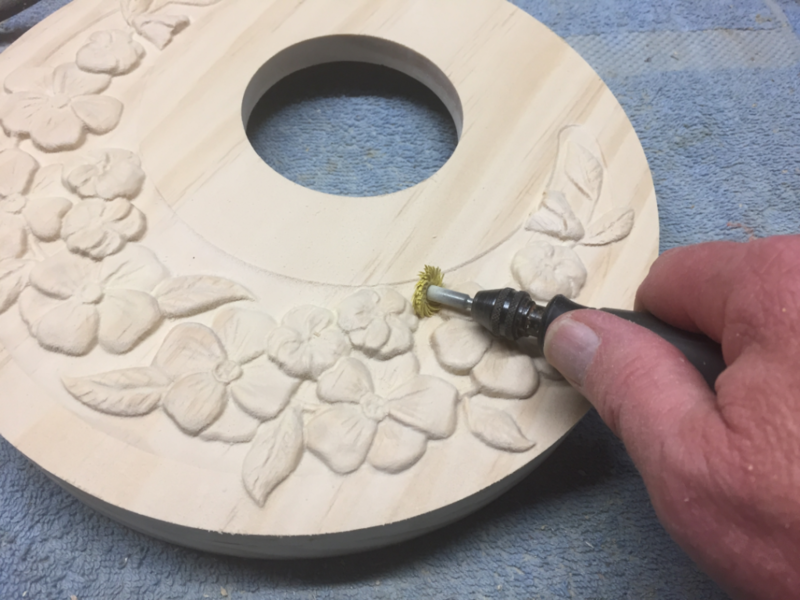 Remove the 1/16″ carving bit and insert your 1/8″ cutting bit. Press the green ENTER button. The machine will perform the cutouts. Mark the back panel (the one with the large hole). 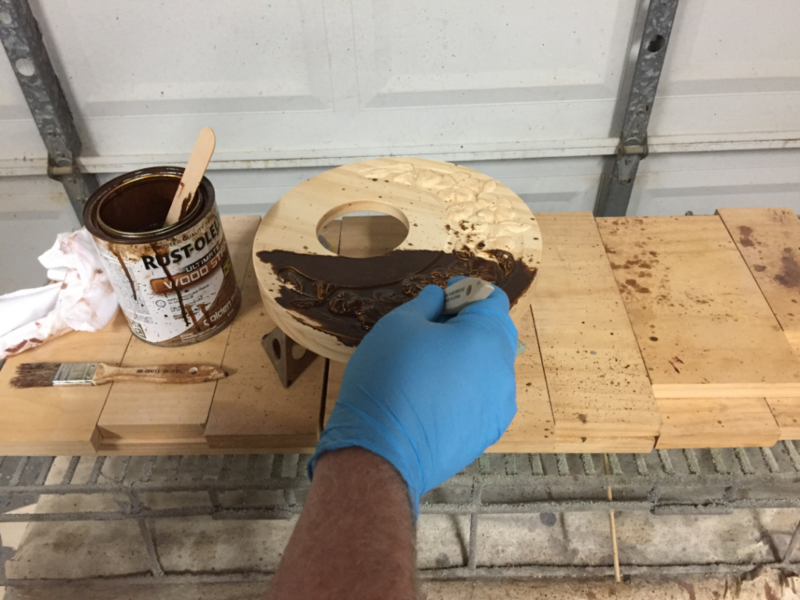 This marked side becomes the back of the clock when the front and back panels are glued together. Separate all the parts from the boards with a utility knife or small saw. 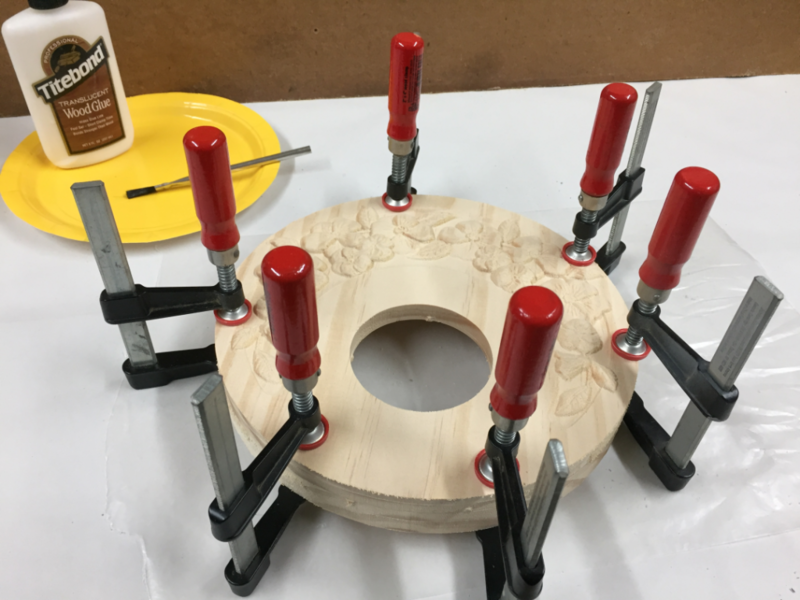 Sand off any tabs and fuzzies that could interfere with glue-up. Separate the parts from the board. 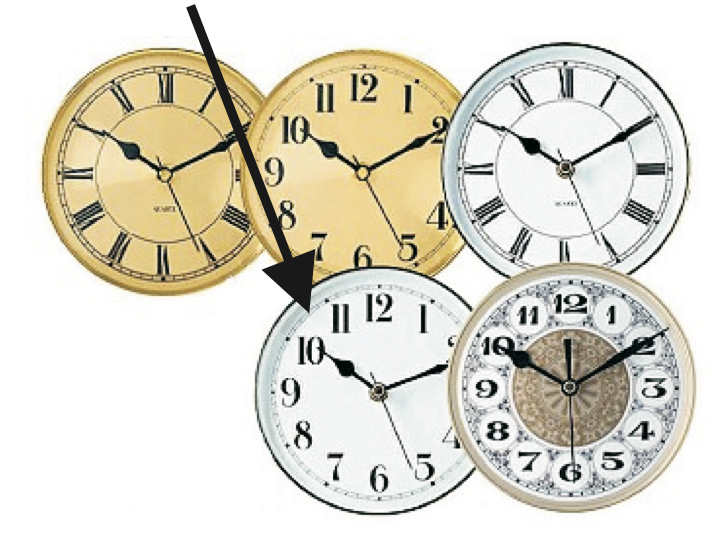 Glue the clock sections together. Align the large hole so there is equal space around the small hole. (You can “eyeball” that – it is not a critical measurement.) Clamp until dry. Glue the front and back clock sections together. Align large hole and small hole so they are approximately centered with each other. 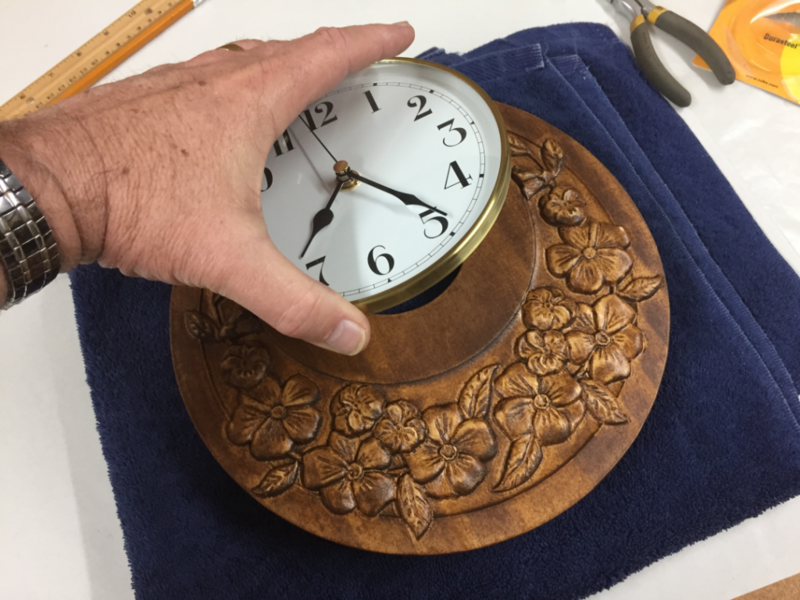 After glue is dry, test fit the clock insert. Sand the insert hole, if necessary, for a snug fit. Sand the carving details to remove any undesirable toolmarks and fuzzies. Sand the outside edge perimeter to blend the glued sections. Apply the finish of your choice. Here’s what I used on the sample made from Select Pine. Applied one coat thinned Bulls Eye SealCoat overall (50/50 denatured alcohol and SealCoat), and then sanded quickly with a 220 grit sanding mop when dry. 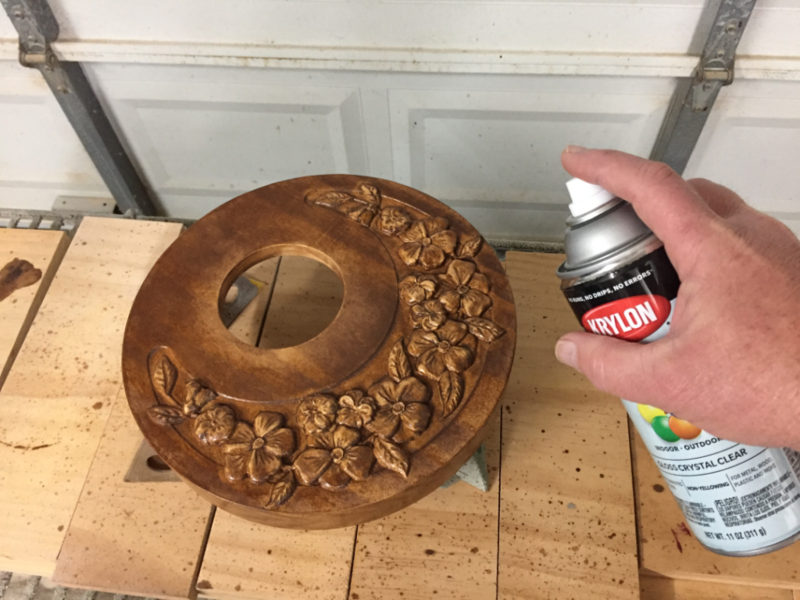 Applied Rust-Oleum Golden Mahogany stain. Flip the assembly over and mark two locations for the screw eyes. 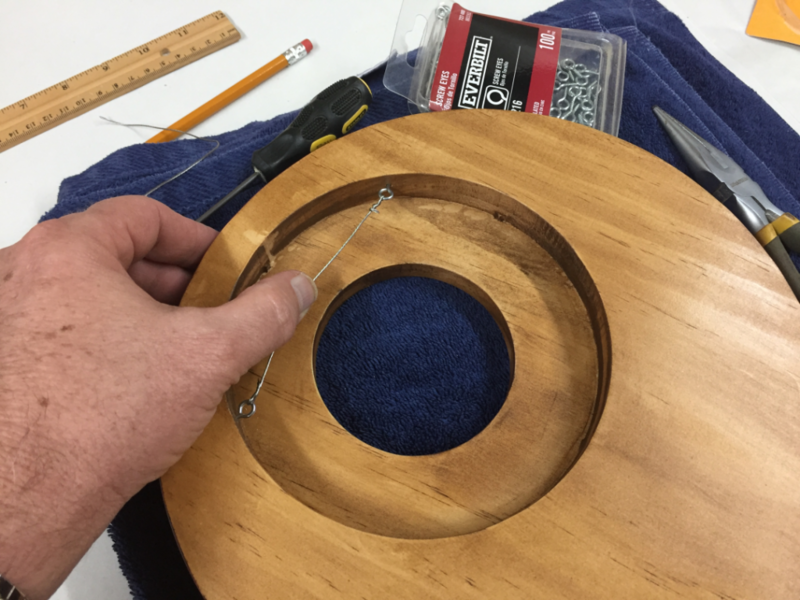 Make pilot holes with an awl or small drill bit above the clock insert hole. Install the screw eyes and picture wire. The wire should be taut. 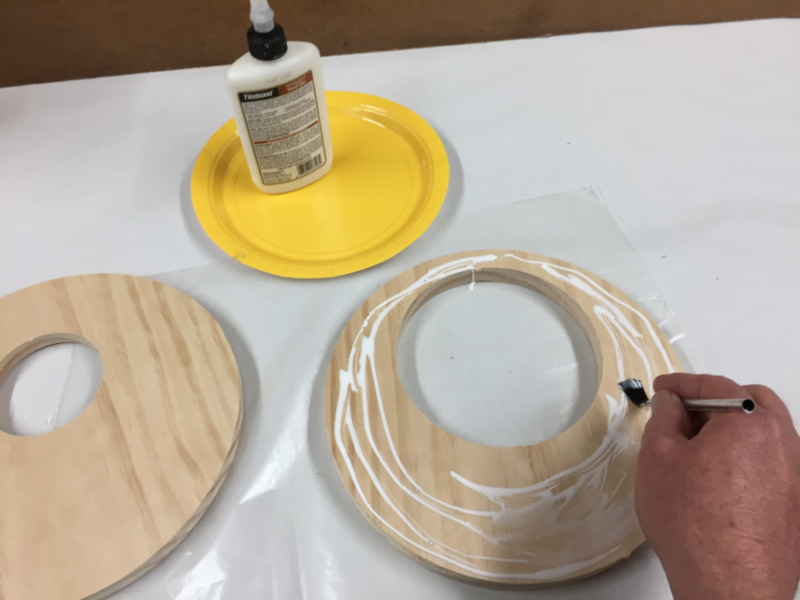 Push the clock insert into the front center hole – it’s a friction fit. 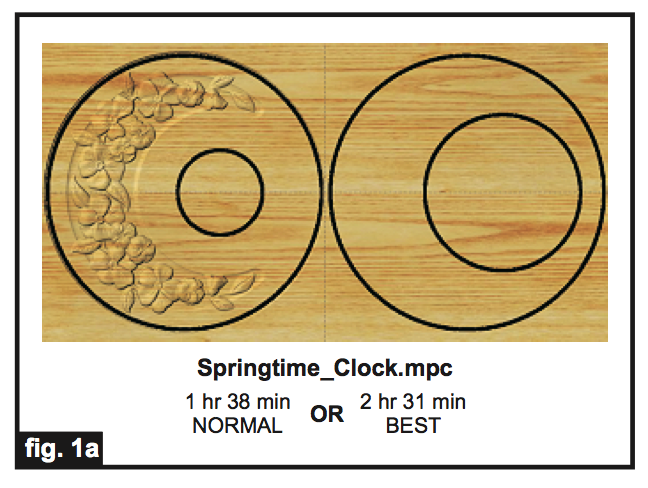 I hope you enjoyed making your Springtime Clock! This entry was published on April 5, 2019 / Joe Lovchik. 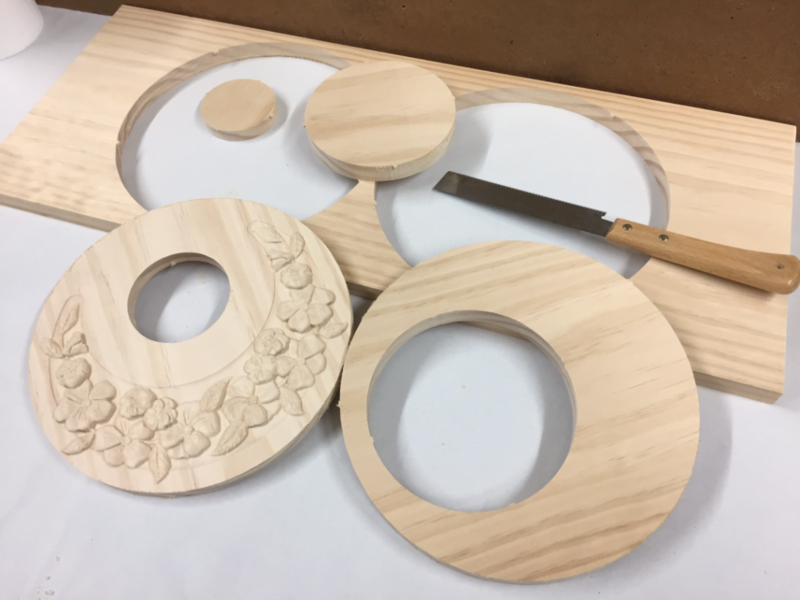 Posted in The CarveWright Build Blog. Bookmark the permalink.